I read with concern on the remark passed by Dr M about Malays in Singapore. 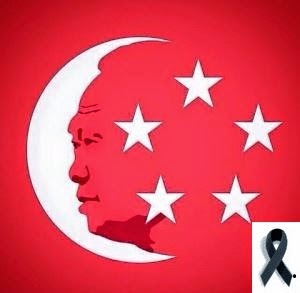 What utter rubbish was he talking about "Malays in Singapore is not supported by the Government". No wonder Malaysia is chaotic in the sense of politics. I think Dr M should keep his mouth shut if he had nothing better to do. If I want to comment, I think our Singapore Malays are smarter and hard working. Look at their education, so many now are intelligent and hold high positions in various private sectors and even in government - not that they are Bumis. They are there at their own credits. They live in better homes and are opened to various ethnic groups around them. I have neighbors' children that play along the corridor with others and they speak Mandarin. These Malay children are one up against other children because others do not speak Malay. Parents are more open and the Singapore Malays got STYLE. Our Government works so hard to achieve racial harmony and here is someone who should be retired and happily ''grand-fathering'' to shoot his mouth without thinking what he spewed carelessly can cause uneasiness among others. Dr M, you should go sit in the backyard, smoke a pipe, watch your grand children ran around, eat your favorite nasi, watch TV and now World Cup is on and enjoy life while you still have it. POWER...POWER...POWER... once one enter the grave, what power? By the way, not everyone is power crazy. It is all these unhealthy careless remarks and fanning of disharmony that's where all the terrorists started. People think that they are victimized and others used religion and dissatisfaction and a group of people run amok, loosing their minds and judgement. I have watch our Government and I really think that our leaders are GENTLEMEN! Many issues from railway station, to water to whatever insults hurled at Singapore, we lied low. No one bother to retaliate except for me here and maybe some more because we felt the itch bitten by a mite and need to scratch. Chinese or whatever ethnic groups have Malay neighbors and friends in Singapore and Malaysia. We never think that we need to be more powerful than our Malay counterparts. If there is anything to do with politics, leave it to the people who are interested in politics...please don't go around shooting at large and generalized everyone. I do not mean to be disrespectful to an elderly man. Respect is earned and not commanded! God bless you, Dr M! Kind words and kind thoughts will make the world a better place to stay! May all the respected leaders in the world be mindful whenever they are giving their valuable speeches! They should not "PROMOTE and ENCOURAGE" hatred, jealousy, uneasiness and unhappiness among all human! They must deliver the right message which will make the world a better place to stay! May all the respected world leaders be well and happy always!